This complete resource on the theory and applications of reliability engineering, probabilistic models and risk analysis consolidates all the latest research, presenting the most up-to-date developments in this field. With comprehensive coverage of the theoretical and practical issues of both classic and modern topics, it also provides a unique commemoration to the centennial of the birth of Boris Gnedenko, one of the most prominent reliability scientists of the twentieth century. Key features include: * expert treatment of probabilistic models and statistical inference from leading scientists, researchers and practitioners in their respective reliability fields * detailed coverage of multi-state system reliability, maintenance models, statistical inference in reliability, systemability, physics of failures and reliability demonstration * many examples and engineering case studies to illustrate the theoretical results and their practical applications in industry Applied Reliability Engineering and Risk Analysis is one of the first works to treat the important areas of degradation analysis, multi-state system reliability, networks and large-scale systems in one comprehensive volume. 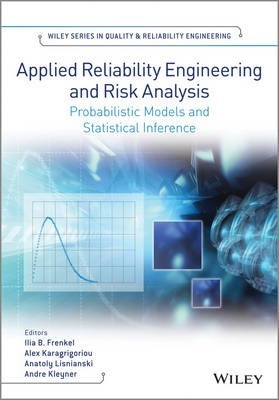 This complete resource on the theory and applications of reliability engineering, probabilistic models and risk analysis consolidates all the latest research, presenting the most up-to-date developments in this field. With comprehensive coverage of the theoretical and practical issues of both classic and modern topics, it also provides a unique commemoration to the centennial of the birth of Boris Gnedenko, one of the most prominent reliability scientists of the twentieth century. Applied Reliability Engineering and Risk Analysis is one of the first works to treat the important areas of degradation analysis, multi-state system reliability, networks and large-scale systems in one comprehensive volume. It is an essential reference for engineers and scientists involved in reliability analysis, applied probability and statistics, reliability engineering and maintenance, logistics, and quality control. It is also a useful resource for graduate students specialising in reliability analysis and applied probability and statistics. Ilia has forty years academic experience, teaching in Russia and Israel. Currently he is a senior lecturer and Director of the Centre for Reliability and Risk Management in the Industrial Engineering and Management Department of the SCE - Shamoon College of Engineering, Israel. Previously he worked as Department Chair and Associate Professor in the Applied Mathematics and Computers Department at Volgograd Civil Engineering Institute. He is a member of the editorial board on Maintenance and Reliability, Communications in Dependability and Quality Management, and has published scientific articles and book chapters in the fields of reliability, applied statistics and production and operation management. Alex is Associate Professor of Statistics, Department of Mathematics and Statistics, University of Cyprus and Professor of Probability and Statistics, University of the Aegean. He worked at the University of Maryland, the United States Department of Agriculture and the Institute of Statistical Sciences, Taiwan, and taught thirty-two courses at the Universities of Maryland, Athens, the Aegean, and Cyprus. He has been involved in the organization of eight international conferences. He has written two textbooks on statistical analysis, teaching notes for undergraduate and graduate courses, and has published more than fifty articles on statistics and applied probability. Alex has served as reviewer for the United States National Security Council and the United Kingdom Economic and Social Research Council. Anatoly is an engineering expert in the Reliability Department of The Israel Electric Corporation Ltd., Israel, an adjunct senior lecturer in Haifa University, Israel, and Scientific Supervisor of the Centre for Reliability and Risk Management in the Industrial Engineering and Management Department of the SCE - Shamoon College of Engineering, Israel. Previous to this he was Senior Researcher in Federal Scientific & Production Center "Aurora" in St-Petersburg, Russia. He is a Senior Member of IEEE, Member of Israel Society of Quality and Israel Statistical Association, and is an author of more than one hundred publications in the field of reliability and applied probability. He has been guest editor for International Journal of Reliability, Quality and Safety Engineering. Andre has twenty-five years of engineering, research, consulting, and managerial experience specializing in the reliability of electronic and mechanical systems. He is currently a Global Reliability Engineering Leader with Delphi Electronics & Safety and an adjunct professor at Purdue University.? He is a senior member of American Society for Quality, a Certified Reliability Engineer, Certified Quality Engineer, and a Six Sigma Black Belt.? He also holds several US and foreign patents and authored multiple publications on the topics of reliability, statistics, warranty management, and lifecycle cost analysis.? Andre Kleyner is Editor of the Wiley Series in Quality & Reliability Engineering.